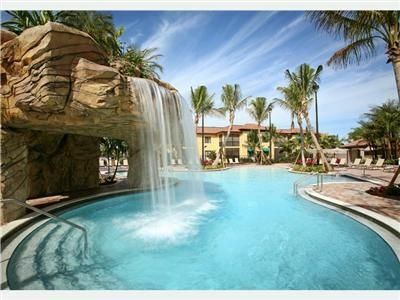 Naples Bay Resort and Spa; 2BR/2BA; Pools; Walk to 5th Ave. This top floor pool/fountain view condo is in THE BEST location at the resort!! With it's gorgeous view, quiet and serene sound from the fountain, you won't be sorry you chose us! Resort includes Poolside Bar and Grill, the best pools with Grotto and Lazy River, state-of-the-art fitness club with Yoga/Pilates studio, world class award winning spa, 8 lighted Har-Tru championship tennis courts, free beach shuttle, membership to 5 of the area's top golf courses. With the hotel directly on Naples Bay and adjacent to the Cottages, additional amenities include use of Marina and Yacht Club on Naples Bay with boat rentals (canoe and paddle board also) as well as shopping and dining on Naples Bay. With a spa on site, ultimate relaxation is just steps away. Don't want to pay for a treatment? You are welcome to use spa facilities for your enjoyment. Gym is state-of-the-art. Tennis courts are Har-Tru lighted. Kids will love playground and Lazy River. Grown-ups will love Adult-only pool and Mineral Lap Pool. Have lunch by the pool at Blue Water Bar and Grill. Condo has jetted tub in Master Bath that both kids and grown-ups will love. Sit on the lanai and listen to the peaceful sounds of the fountain and enjoy your view of the bridge leading to the pool. Ah, this is living! Life is better here! It was an okay property but have stayed in much nicer for less. The carpet and sofa is very dirty looking and needs to be cleaned well or replaced. The granite counters appeared worn and stained and would looked much better if buffed and polished! Location was great. Felt like a Vacation in Mexico! The pool area was so beautiful, with great drinks, food and service. Nice for families and for adults. The condo was in a great location for access to the pool. The beds were both very comfortable! Location was perfect and the shuttle took you to all the hot spots, 5th Ave, 3rd Street and the Naples Pier. The shuttle drivers were excellent and kind and provided a wheelchair for my mother on one of our outings. The food at Bonefish, which is part of the Resort, was excellent and convenient. We also liked the ability to cook our own meals, which we did often and had all the kitchen items that we needed. The gym was very nice and always busy. I enjoyed the outside lap pool. The grounds were immaculate. We were very pleased! My husband & I rented this codo for a week. It was comfortable, clean and nicely decorated. Naples Bay Resort is located close to the shops & restaurants on 5th Avenue. The amenities of the resort made it an excellent place to relax. The communication with the owner was great. I highly recommend this rental. We hope to return next year. Great property and resort. Perfect location. very well kept; clean and spacious. The pools were terrific. The unit we stayed in was very nicely decorated and had EVERYTHING you need, just like our own home! Felipe was tremendous as a host!!! Forgot to mention that the Condo owner made sure we had everything we needed and since this is our first VRBO, gave clear and easy to follow instructions/directions ! She was very good to us !!! Located on Fifth Ave. South in Olde Naples, this resort is a short walk to downtown and five minutes to Gulf Beaches by car or the resort provides a free beach shuttle. World class dining and shopping is plentiful in walking or driving distance. Golf courses galore, biking, hiking, miniature golf, Naples Zoo and Conservancy, Coastal Mall, Naples Pier and fishing, boating, water sports...the list goes on and on!